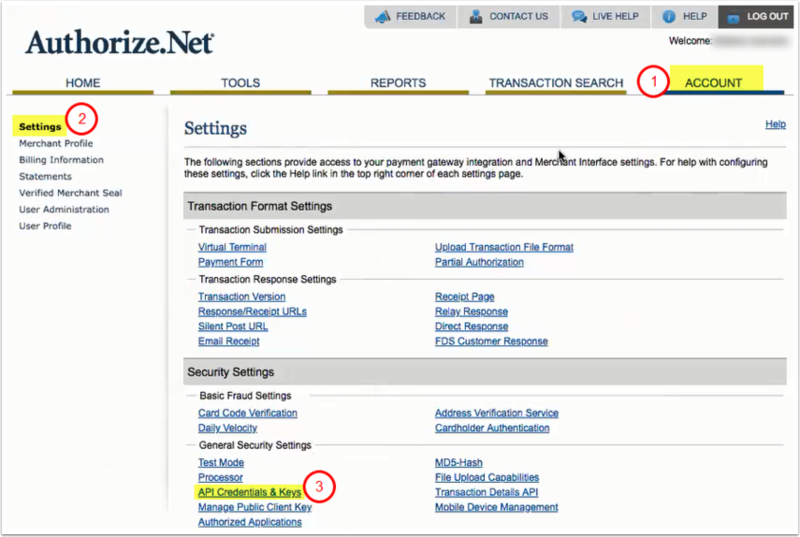 Authorize.net is one of the many payment processing providers we connect with through our Payment Gateway Feature. 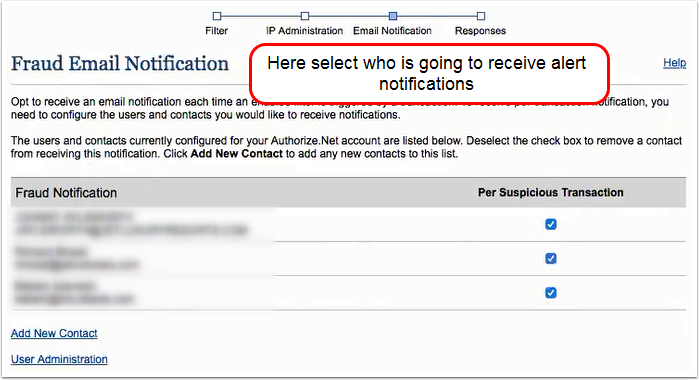 If you do not have an Authorize.net account already, you will need to sign up for one. Since signing up with a Payment Gateway involves financial details and contract negotiations, we cannot legally create an account for you. If you already have Authorize.Net account - go to step 2. To connect Authorize.net account, you will need both your Authorize.net API Login and Transaction Key. This is not the normal credentials you use to login to your account, but the credentials for connecting the two systems together through the API. 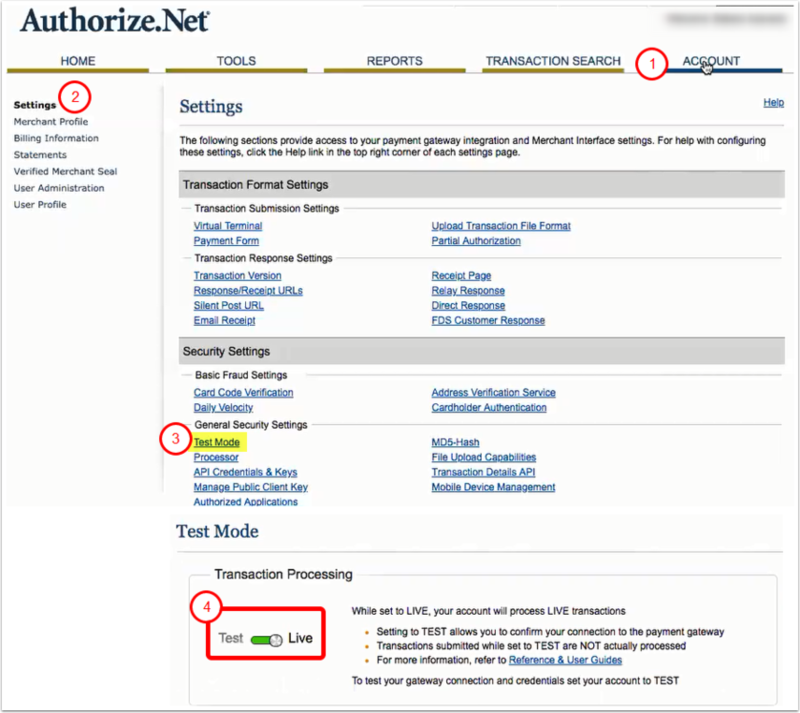 Here are the instructions for finding the Authorize.net API login and transaction key from Authorize.net. They are included below, but can also be found here. Log into the Merchant Interface at https://account.authorize.net. Click Account from the main toolbar. Click API Credentials and Key from the Security Settings section. NOTE: Authorize.net only displays a given Transaction Key when it is first generated. If you generate a new Transaction Key, any software or code using the previous Transaction Key will need to be updated with the new Transaction Key to avoid errors. 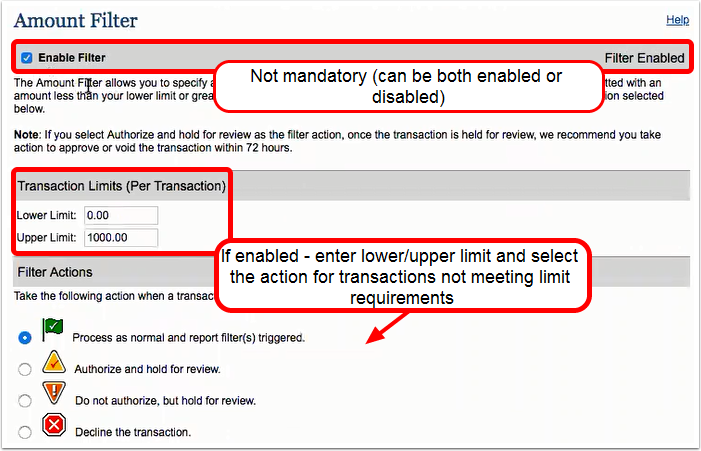 If the "Disable Old Transaction Key" box is not checked, the old Transaction Key will automatically expire in 24 hours. When the box is checked, the old Transaction Key will expire immediately. If you have current software installations, do not check this box unless you need to immediately cease all payment processing through your software setup. By not checking the box, the old Transaction Key would remain valid for 24 hours, giving you time to update your software to use the new Transaction Key. Be sure to store the Transaction Key in a very safe place. Once it has been generated, it will not be viewable again. Do not share it with anyone, as it is used to protect your transactions. For Server Integration Method (SIM), the Transaction Key is also used to create a unique transaction fingerprint. Using the Transaction Key and a few pieces of information specific to the transaction, a script on the merchant's Web server uses a complex mathematical algorithm to generate a document fingerprint. This fingerprint is submitted along with the transaction information to the gateway. Before accepting the transaction, the gateway will use the Transaction Key and the transaction's data to recreate the unique transaction fingerprint. If the fingerprint generated by the gateway matches the fingerprint submitted with the transaction by the merchant, the transaction is accepted for authorization. If the fingerprints do not match, the origin of the transaction cannot be authenticated, and the transaction is rejected. 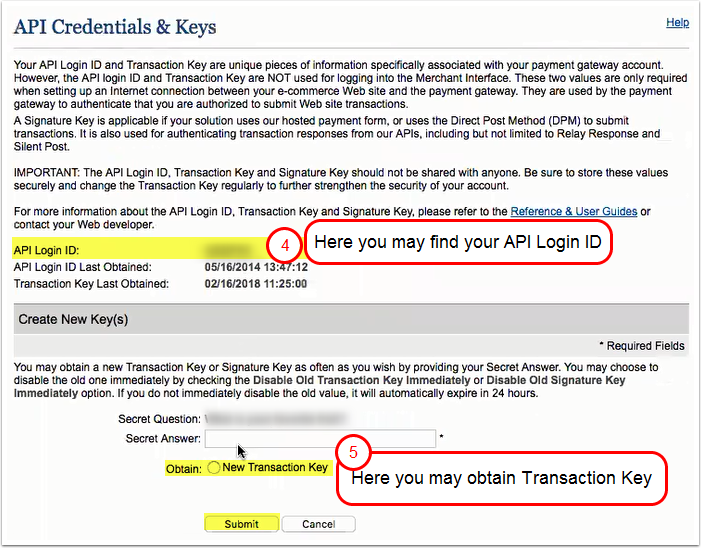 For other APIs such as the Advanced Integration Method (AIM), Card Present (CP), Automated Recurring Billing (ARB) and Customer Information Manager (CIM), the Transaction Key is encrypted along with all other transaction data when it is sent to Authorize.Net, and is directly used to authenticate requests submitted to the gateway. 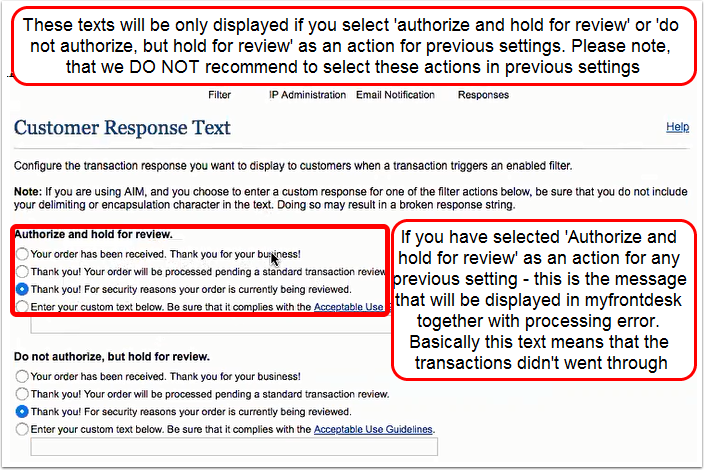 If a request cannot be authenticated using the Transaction Key , the request is rejected. You may generate a new Transaction Key as often as you wish. In order to connect Authorize.Net to myfrontdesk you need to have payment processing functionality enabled (extra paid feature). Please contact us at support@cloudbeds.com to receive more information and request enabling payment processing functionality. Click Settings in the main menu on the left. Click Test Mode under the Security Settings section. Drag the toggle to Live. The interface will confirm that the Test Mode settings have been successfully applied and the account is now in Live Mode. 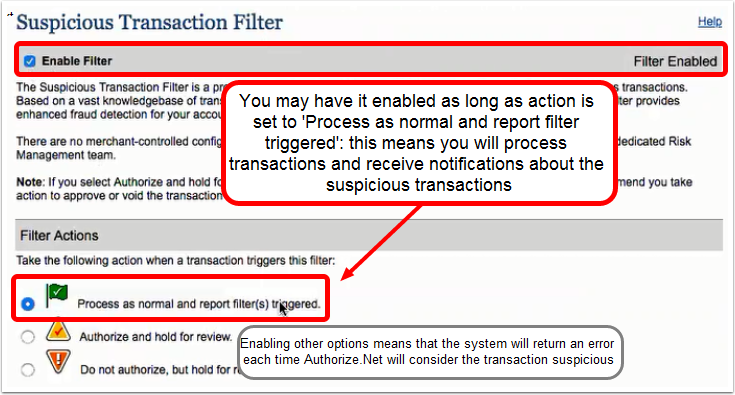 We recommend to disable AVS/certain Fraud Detection rules which allows to process the credit cards through myfrontdesk even if they have no billing address filled in. This is recommended as most of the channels/OTAs do not send credit card details with billing address to myfrontdesk, which means that you won't be able to process them through myfrontdesk unless billing address is entered manually. 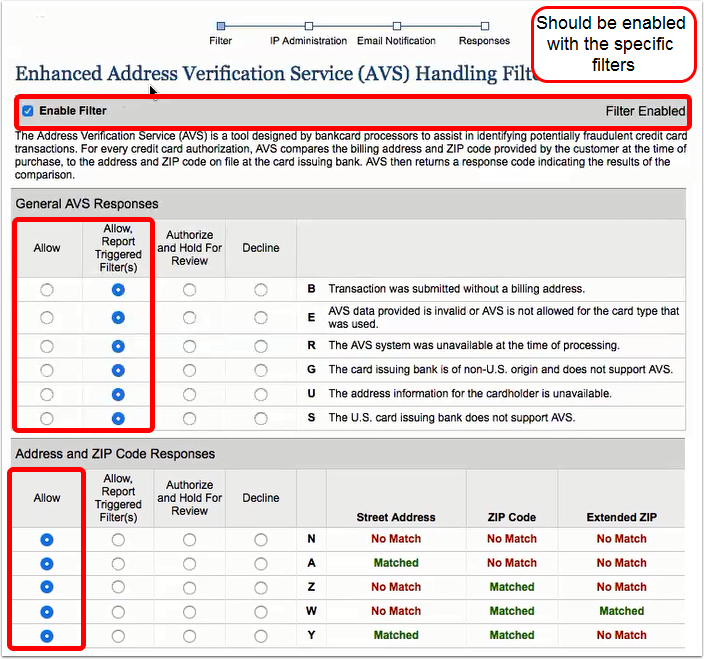 3) What should I do if I want to have AVS enabled on Authorize.Net? If you want to use AVS (address verification system inside gateway) - gateway will require that the credit card which needs to be charged includes all the needed billing address fields. 2) for OTA reservations: myfrontdesk can't control whether your guests booking through OTA will send their billing address with credit card details. Sometimes making billing address required field on OTA can be controlled on Extranet but as a rule OTAs do not billing address to myfrontdesk and do not collect this data, only the main credit card info (cardholder name, card number, card type, CVV). 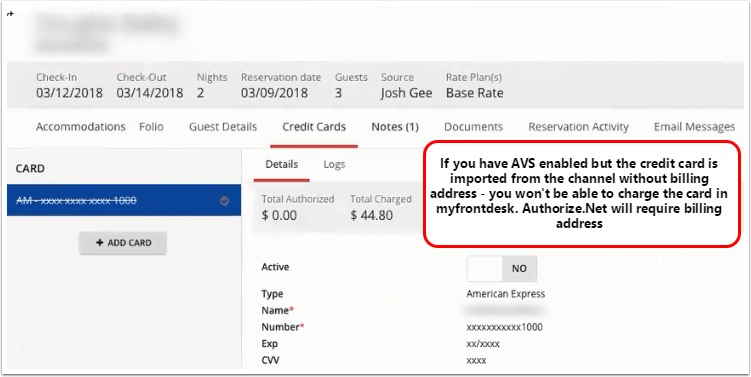 If you have AVS enabled but the credit card will be imported from the channel without billing address - you won't be able to charge the card through myfrontdesk. Around midnight, Authorize.net takes all of the transactions that occurred during that day and submits them to the bank for settlement. After this process, the transaction is considered "settled," and only once a transaction has been settled can you issue a refund/credit. This is an Authorize.net policy and is not something that can be changed from within the Cloudbeds platform.